In anticipation of “Trans//Border”, a tribute to the French activist and navigator Nathalie Magnan in Marseille, Rob La Frenais takes us on a guided tour of aquatic projects by makers, artists and activists. 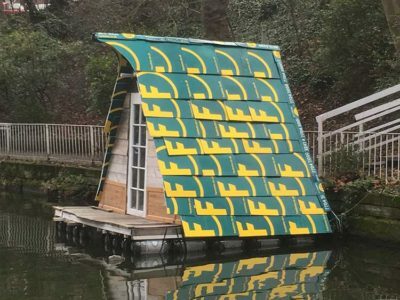 Two homeless people in London recently made headlines in the UK by designing a floating DIY “Wendy House”, which floated on the Regent’s Canal. Made with “For Sale” boards from a well-known London estate agent, it was destroyed by the canal authorities after two weeks. Max Bloom and Stephen Watt decided to build the innnovative floating house after they became homeless, and they were trying to get is registered as a boat, a neighboring canal-dweller told the Evening Standard. Boats and homelesseness are in the news right now. In Paris, a historic barge designed by Le Corbusier to house the homeless, the Louise-Catherine, recently sunk after the Seine river flooded. Makery has already written about geek piracy, UFOs and sail cargo fair trade, especially through the activities of the Time’s Up Boating Association and the FutureFarmers Seed Journey. As a sort of preamble to Trans//Border, a celebration of the life of the French cyberfeminist Nathalie Magnan, at Mucem in Marseille on March 16-18, we look here at the history of artists’ floating vehicles, discovering new prototypes and initiatives along the way. Historically, two examples have inspired artists working today. One is the Belgian artist Panamarenko, born in 1940, whose work is continued by a group of young artists called the Panamarenko collective. His impossible submarine, the Pahama Novaya Zembla, has inspired many contemporary artists and makers. The other is Buckminster Fuller, whose innovative Rowing Needles (designed so Fulller could row from his island in Maine) inspired the artist Neal White, who used Fuller’s concept to design what he calls a Rowed Lab Contingency Vehicle—a vehicle designed to be propelled by two human rowers on the traditional sliding seats, as an emergency transmission station to be used in the case of floods or other emergencies. This convergence between dark ecology and activism was reflected in his previous Dark Places, bus tours of hidden nuclear and military sites, where members of the public don high-visibility vests and conduct “overt research”—often to the consternation of the authorities. 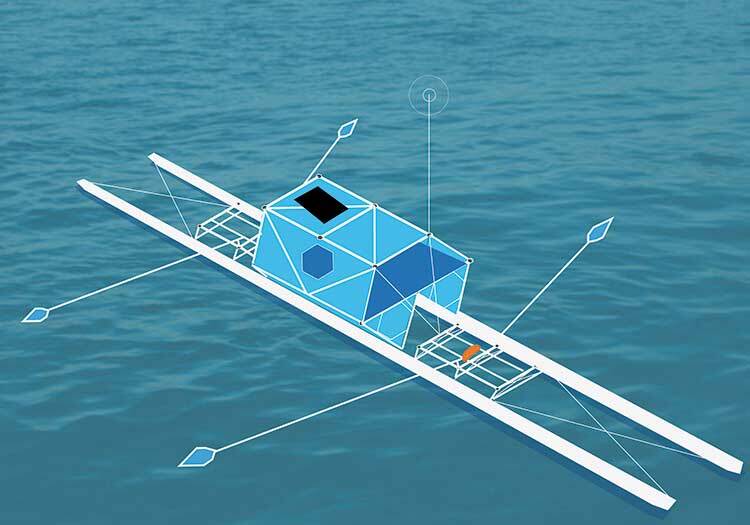 It is also possible that the Rowed Lab could be used to make more overt operations concerning migrants’ floating vehicles with the help of amateur rowing clubs, creating an innovative link between art and sport. Isabel Arvers, who is co-organizing Trans//Border, drew my attention to a number of activist websites about the sea, including Watch The Med and the Anti-Atlas of Borders: “The sea is an information map full of control.” Artists Ashok Sukumaran and Shaina Anand from Mumbai, India, have also made a number of projects about informal shipping lanes. In From Gulf to Gulf to Gulf, they gave the crews of dhows, plying between the Middle East and India with undocumented cargos, smartphones to use on their voyages in exchange for their home movies, which were the sources of their documentary. Like the house made of estate agent’s boards, humor is the one thing that unifies many projects. Finnish artist Antti Laitinen uses found materials to construct different realities. In Growler (2009) he built his own iceberg and towed it out to sea. 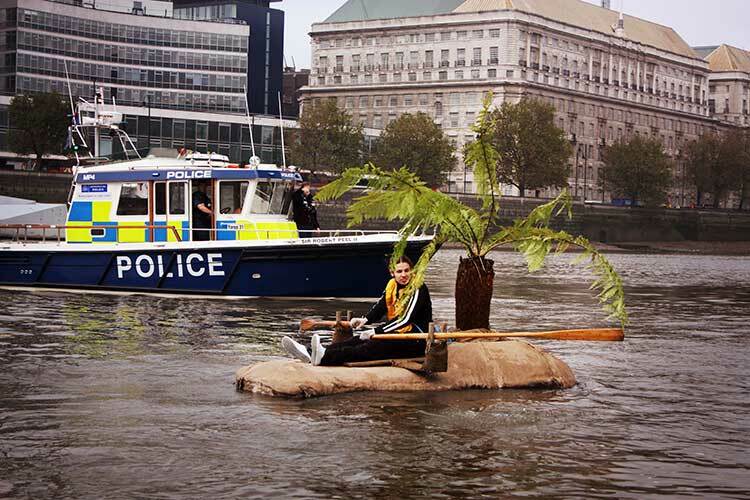 He is most known for It’s My Island (2007) and Voyage (2008), where he rowed an artist-created island, complete with palm tree, out to sea, and later on the River Thames, where he was apprehended by police. 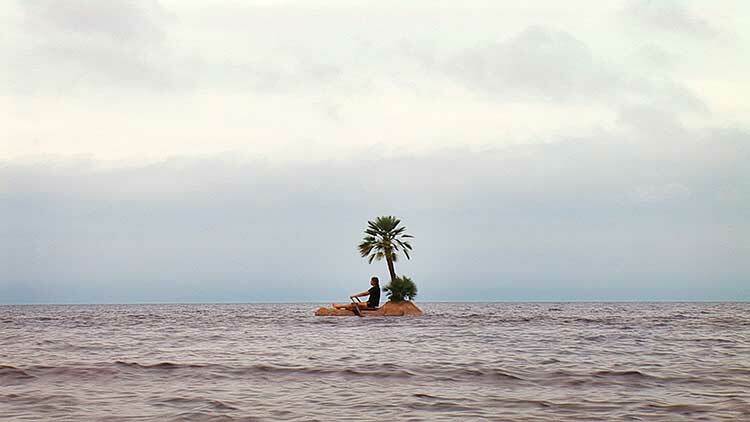 In 2010, his Bark Boat project, developed by the Capsula collective, saw him navigate a piece of tree bark in the Baltic Sea, as part of Curated Expeditions. Australian sound artist Nigel Helyer also designed a series of Sound Coracles featured in his Deluge Ark(ive), which was exhibited in Tasmania in December 2017. Le Havre-based artists-designers HeHe anarchically cross engineering boundaries in works such as Radeau de sauvetage, a sail-powered train. 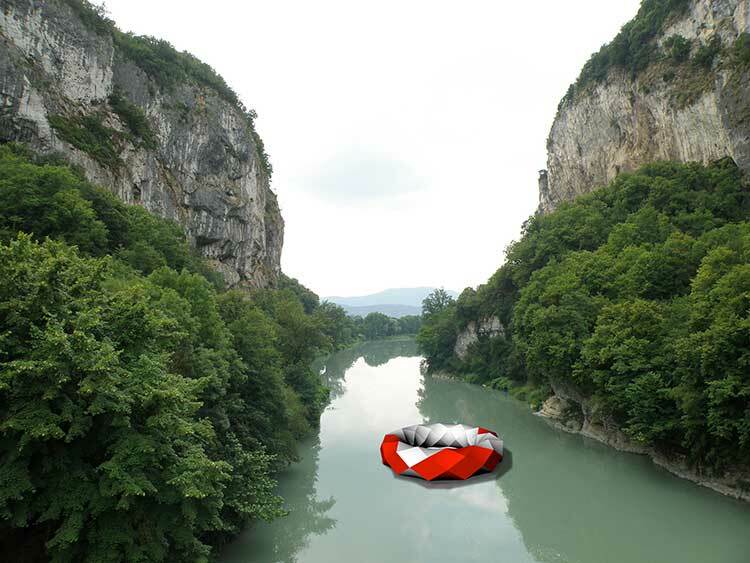 They are planning to build an orbital river station based on Herman (Potočnic) Noordung’s early orbital station designs, as both an emergency vehicle and artwork for one of France’s many flooded rivers. 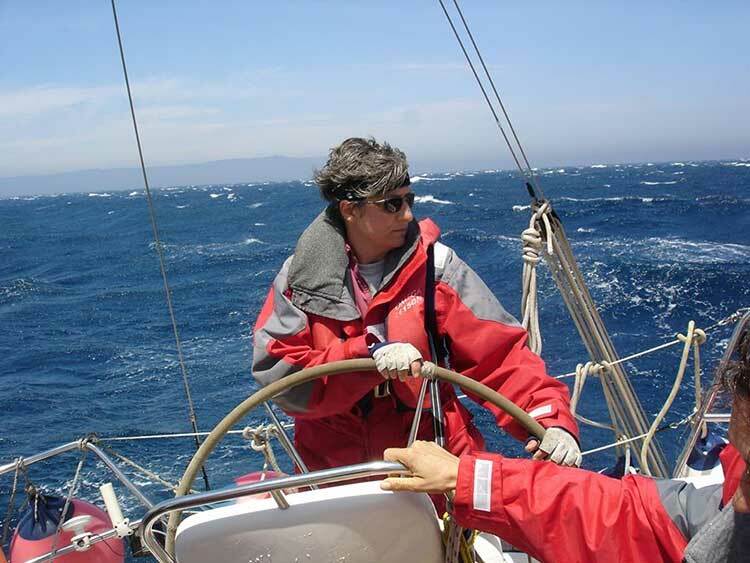 This kind of transgressive technological boundary-crossing was exemplified in Nathalie Magnan’s Sailing for Geeks, which took place first in Finland during ISEA 2004, then during Fadaiat, where the sailboat passed through Tarifa, Tangier and Gibraltar in 2005. Reversing the path followed by so many floating migrants to the shores of Morocco, the boat, equipped with tracking equipment and captained by Magnan, pioneered many projects which now track the “liquid traces” of the Mediterranean and other contested seaways. Moving out of established paradigms of leisure use of water and navigation inspired the Facebook group “Wild Rowing”, which presents alternatives to traditionally organized, competition-obsessed rowing clubs. In 2016, the Times Up Boating Association hosted Row Europe, an activist rowing project on the Danube. However, some clubs are very friendly and take time to teach people of all ages to row. Rowers themselves are very close to the water, understand the currents of rivers very well, and are often very ecologically aware, such as artist/rower Valerie Coffin Price, author (with poet Philip Gross) of A Fold In The River, who sees rowing as “immersion in the landscape”. 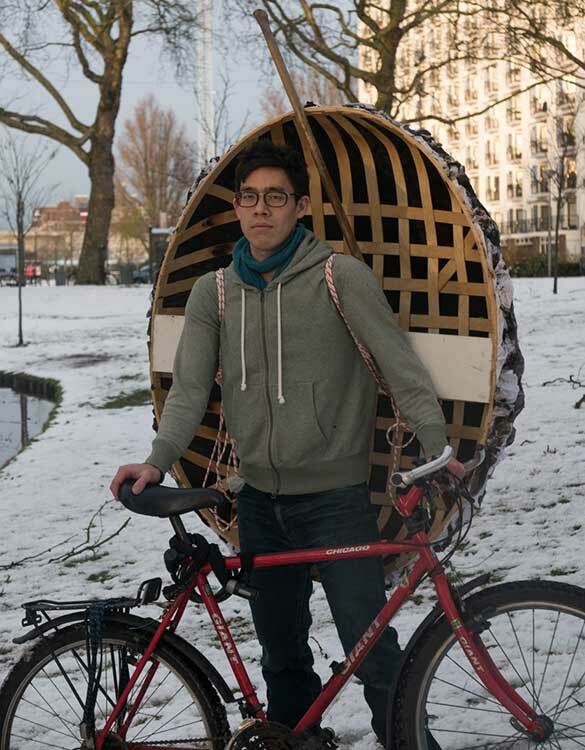 The Wild Rowing group has attracted some 360 people similarly interested in art and rowing, and hopes to organize an artists rowing crew to form an 8 (the lead rower of the Oxford vs. Cambridge boat race) for the next documenta in Kassel. Maker-Rowers are warmly invited! “Trans//Border, the teachings of Nathalie Magnan”, tribute to the theorist and media activist, cyberfeminist, filmmaker and navigator Nathalie Magnan. This article first appeared in English and French in Makery.info France in March 2018.